In "Job Openings and Career Development (JOCD) is One Year Old," I asked for feedback and got it. At least three people learned about the jobs they now have through JOCD. One of them emailed me privately, another left a comment on the post, and the other replied through the Filipino Librarians Googlegroup, where other members also expressed support for the blog. An employer also wrote to say that many of the applicants he interviewed for a position mentioned JOCD. Here's hoping that another JOCD reader gets hired. Needless to say, JOCD will keep on going. But I'd like to ask for some help. There is no charge for advertising on JOCD or reading the posts, but please let me know if you found the blog helpful in finding a job or an employee, so that I don't have to wonder whether it's worth the effort. My email address is von-dot-totanes-at-gmail-dot-com. While libraries are front and center in two new articles (see "ARMM gov orders establishment of libraries in LGUs" [PIA Press Release, 25 October 2007] and "Public libraries and Kaakbay" by Neni Sta. Romana Cruz [Philippine Daily Inquirer, 27 October 2007]), librarians are mentioned almost as an afterthought. I do not blame the authors, however, for this treatment. I have groused about the invisibility of librarians before, but after blogging for more than two years, monitoring what appears in print and online about Filipino librarians, contributing what I can to promote librarians worth emulating, and encouraging others to write about their own experiences, I think it's time to admit that the fault lies "not in our stars, but in ourselves." Many librarians complain that their communities think they do not do anything but sit at their desks and stamp books. But what, I usually ask, are they doing to dispel this notion? We need to be more proactive about communicating and interacting with our own communities, and networking—and working—with other literacy and library advocates. I have gotten feedback that projects initiated by "outsiders" were left unsupported by library "insiders" because the latter felt that they should be the ones taking the lead. And all I could do was shake my head, and admit that some of our more influential librarians can be rather shortsighted. There are, of course, certain things that "insiders" can do better than "outsiders," but when more of them do research about our own work, and it is because of them that Filipiniana is freely available online, I think we need to thank them, instead of criticizing them for encroaching on our turf. Enough. If you'd like to see more of what I've written about this, click here: Leadership. Note: Click on the photos to see the larger versions. The links below lead to sites featured in the presentation I will be making today at the 3rd Rizal Library International Conference held at the Ateneo de Manila University, 22-23 October 2007. Those that I have previously written about will have two links: one to the site, and the other to my post [in brackets]. In the next few days (maybe weeks), I will be writing about the others, and updating this post accordingly. 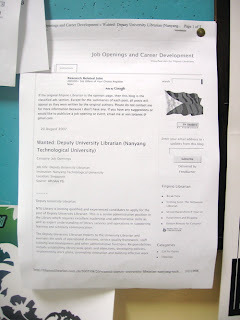 Today is the first anniversary of Job Openings and Career Development (JOCD), the other Filipino Librarian blog devoted to employment opportunities and other career-related notices. It currently has 141 subscribers and I get a few emails every now and then that tell me it's being read. The photo above even shows that some posts get printed and thumb tacked to real bulletin boards. I would like to know, however, whether anyone has ever gotten hired because s/he read about an opening on JOCD. Alternatively, has an employer whose job opening was listed on JOCD ever hired someone who said that s/he saw their ad on JOCD? Please, please, please leave a comment below or email me at von-dot-totanes-at-gmail-dot-com to tell me your story. If you don't mind, maybe we can even share the details with everyone who reads this blog. But please let me know because JOCD takes a bit of effort that I could probably devote to this blog. If I don't hear from anyone, then I suppose it's time to close JOCD. The video above was taken at the National Book Development Board's monthly book club meeting, held at Mag:net Cafe Katipunan yesterday. The featured author was Butch Dalisay, multi-awarded author of books, plays and screenplays, who spoke about writing short stories with no grand designs, but small challenges like starting with one sentence and seeing where the story goes. Dalisay blogs (!) at Pinoy Penman, and was the lone Filipino longlisted for the first-ever Man Asian Literary Prize. Only five of the 23 authors on the long list will make it to the short list to be announced on 25 October 2007. Here's hoping he wins the Prize when it's announced in Hong Kong next month. Mabuhay! Welcome to the October 15 edition of the Carnival of the Infosciences (COTI). In the Philippines, a "carnival" will bring up memories—depending on age and geographic location—of Fiesta Carnival, Enchanted Kingdom, the local karnabal, perya (fair) or peryahan. The video above gives a flavor of the Filipino perya, not to mention the Filipinos who ride them and what they do with their phone cameras. The views it provides from above and from below also indicate the international character of this particular carnival post, which is probably the first posted from Asia. Note: Unless otherwise indicated, authors are librarians from the Philippines. If you have time for only one post at this time, do read the one by Juned Sonido, who asks "What is the technoweenie?" and proceeds to differentiate between the Technophile, Technophobe and Technoweenie (aka Technosexual! ), and even pokes fun at GOD and GAS. 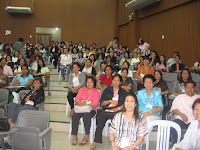 Other Filipino librarians all seem to have chosen to write about their personal experiences, which reveal quite a lot about the situation of libraries and library education in the Philippines. Igor Cabbab recalls the numerous humorous—and not-so-humorous—events that happened to him in "My Life in the SLIS: UP SLIS ca. 1990 to 2002"; Eimee Lagrama reviews her alumni association's accomplishments and her frustrations during her term as its president in "Giving something back"; and Zarah Gagatiga writes about the prejudices she encountered while still a student in "A School Librarian's Pride (and Prejudice)." Meanwhile, Melchor Cichon looks to the future and shares his dream as a new university librarian in "My Vision of a University Library." While Charles Tan, a library user, notes that libraries in the Philippines do not differentiate themselves well enough, especially on their websites, in "Specialized Libraries." Submissions from around the world included those from Ivan Chew (Singapore), who, in "Facebook at work: Address the cause, not hide the symptom," tackles an issue that librarians who are into social networking will encounter sooner or later. Daithi Mac Sithigh (Ireland), a lawyer, expresses misgivings about a pending bill that would make a library's public lending rights a "Public Lending Wrong." And John Dupuis (Canada), in an "Interview with Richard Akerman, Technology Architect at CISTI," presents a techie's thoughts on the relationship between techies and librarians. Finally, Larry Ferlazzo (USA), an ESL teacher, shares links to websites that may be used to prepare new English speakers for trips to "Libraries"; and John Miedema (Canada), a library student, who reviews "Balanced Libraries by Walt Crawford," and writes that, "It could be the bible of the Slow Library movement." Well, that's it for this edition of COTI. If you have no idea what COTI is all about, its purpose is "to showcase the panoply of great writing within the [biblioblogosphere] and to expose the world to as many [Library and Information Science] blogs as possible." Join the next edition of the carnival by: 1) using the carnival submission form; or 2) using the del.icio.us tag "carninfo." For past posts, future hosts and other information, check out the COTI wiki. Technorati tags: carnival of the infosciences, blog carnival. 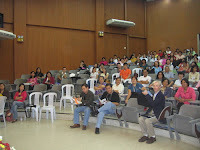 The Philippine Librarians Association, Inc.-Southern Tagalog Region Librarians Council (PLAI-STRLC) invited me to be a speaker at their seminar-workshop on "Research in Librarianship: Challenges, Competencies, and Strategies," which began yesterday and ended today in Calamba City, Laguna. 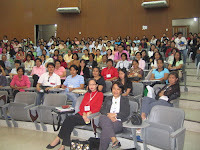 My topic was "Research Methods," while Elvie Lapuz took care of "Proposal Writing & Research Funds and Grant Seeking." The links below are listed for the benefit of those who attended our sessions, but may be useful even for those who were not there. Ambeth Ocampo: "There is so much obscure information to be found and so few researchers in libraries." When Pacquiao KOd Solis right before the last elections, I wrote that, "Rep. Pacquiao will be making an appearance at the House of Representatives soon." Well, it's a good thing my prediction was wrong, and voters decided that Pacquiao should stick to boxing. But don't count him out because he hasn't lost his Will to Win. While other world champions obediently line up for a few hours of instruction... Pacquiao has enough interests outside the ropes to keep several men occupied for several lifetimes. Movies, music, politics, basketball, charity, family - they're all important to the Philippines' favorite son, and they vie for his attention whenever he isn't boxing. Those in the Philippines can watch the fight on TV via free-but-there-are-so-many-ads GMA. You can go to local theaters or other venues to watch the fight in real time with other fans for a fee (SM Cinema will be charging P500 and P400 for reserved and guaranteed seats, respectively). Or if you're lucky, you might be able to watch it for free in one of the cities where the local governments will sponsor no-commercial-break showings of the fight (e.g., the city of Manila). HBO is the place to go if you live in North America and are willing to pay your cable provider's PPV rates. If you're in Australia, Main Event has instructions on its website. If you're in the Middle East or some other place where the Internet is the only option, you may want to try your luck with SopCast, which allows users to watch live events via P2P technology (via YuwonCedric.com). If this doesn't work for you, you'll just have to wait for Pinoy Rickey to upload clips in his usual uploaded-within-minutes style. And if you really can't watch the fight on TV or online, news updates will be available on Inquirer.net's "The Pacquiao Files," Google News, Yahoo! News, and Topix.net. Or you can check out what bloggers are saying on Technorati and Google Blog Search. Finally, Pacland has the latest news about Pacquiao from different sources, plus information about all previous fights and a forum for his fans. By the way, for the benefit of those with editor-itis—and search engines LOL!—PacqUIAO is not spelled PacqUAIO or PacqUIO. The Carnival of the Infosciences (COTI) crossed the Pacific Ocean recently and is now up Down Under at Connecting Librarian. On October 15, the Carnival moves to this blog, and I will try to give our foreign guests a taste of Filipino hospitality. If you have no idea what COTI is all about, its purpose is "to showcase the panoply of great writing within the [biblioblogosphere] and to expose the world to as many [Library and Information Science] blogs as possible." For past posts, future hosts and other information, check out the COTI wiki. If you are a librarian who blogs (liblogger, blograrian, liblogarian, take your pick! ), you may want to consider submitting one of your own LIS-related posts published from October 1 onward. Filipino blograrians and other Asian librarians are highly encouraged to take this opportunity to tell our counterparts on the other side of the world about how we do—or don't do—things over here. You may also submit posts written by other bloggers. Only submissions "containing original thought and opinions, rather than regurgitation and reiteration," will be included in my post on October 15. How do you submit? You can: 1) use the carnival submission form; or 2) use the del.icio.us tag "carninfo," but you must use the notes field to state why you tagged it and sign your name, so we know who shared it with us. Send submissions for COTI 81 by 6 pm Manila-time (that's 6 am EST) on Sunday, October 14.